A native of St. Petersburg, Russia and now living in New York City, cellist ADRIAN DAUROV is one of the most dazzling artists of his generation. Adrian Daurov, at the age of 15, made his debut as soloist with the St. Petersburg State Symphony Orchestra. Subsequently, he earned top honors at three international competitions - Bulgaria’s 1st International Music Competition “Coast of Hope” (First Prize, 1996); The Netherlands’ Peter De Grote International Music Competition (Grand Prix, 2002); New York City’s L.I.S.M.A. International Music Competition (First Prize, 2004). In 2004, he toured as soloist with the St. Petersburg Chamber Orchestra, performing in St. Petersburg, Moscow, Warsaw and throughout Germany, and was appointed to the dual position of principal cellist and soloist with the Bayreuth Youth Festival Orchestra, under the baton of Peter Gulke. 2008 heard him as a featured participant in a gala Carnegie Hall concert celebrating Russia’s Independence Day, a program that included the distinguished Russian singers Yelena Obratztsova and Vladimir Galouzine. After studying at the St. Petersburg Conservatory, Adrian Daurov was awarded the Jerome L. Greene Scholarship for advanced studies at The Juilliard School with the renowned cello pedagogue David Soyer (of the Guarneri Quartet). At Juilliard, he completed his Bachelor’s and Master’s degrees, graduating in 2009. 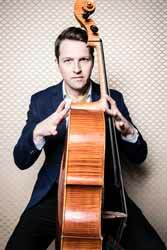 While still in school, he was appointed principal cellist of The Chamber Orchestra of New York. Mr. Daurov has also collaborated in chamber music programs with pianists Alexander Ghindin and Olga Vinokur, violinist Mark Peskanov and flutist Eugenia Zukerman. Recent seasons have been highlighted by debuts with the Bozeman, Glacier, Kalamazoo, Longwood, Ridgefield, Westerville and Wyoming symphony orchestras and Long Island’s Massapequa Philharmonic Orchestra. In 2012, he teamed up with the award-winning pianist Spencer Myer to form the Daurov/Myer Duo. Passionately devoted to the music of our own time, Adrian Daurov has already presented the world premieres of two important works - In 2008, Fountains of Fin for flute, violin and cello by the Persian composer Behzad Ranjbaran and, in 2009, The Epistle - Concerto for Cello & Chamber Choir by the Siberian composer Yuri Yukechev, written for Mr. Daurov and the Russian Chamber Chorus of New York, Nikolai Kachanov, Artistic Director. Adrian Daurov’s artistry has been heard on several radio and televison stations, including WNYC, WQXR and NTV-America. He is also featured on a recent album by the young New York City-based jazz star Romain Collin. Adrian Daurov performs on a magnificent 1989 cello crafted by John Terry in Florence, Italy. Cellist Adrian Daurov is a superb artist whose playing is both virtuosic and movingly expressive, reflecting both his assimilation of the emotional center, directions and flow of the music he is playing and his ability to communicate that assimilation to an audience, both aurally and visually. Apart from what may or not may not have inspired Shostakovich’s concerto [#1], his score is musically impressive, with an energetic, almost frenetic first movement, a lyrically moving second, a solo cadenza so long that Shostakovich counted it as an additional movement, and a summarizing finale that ends in an impressive virtuosic display. Daurov managed all of it to expressive perfection. First of all, a huge thank YOU for suggesting Adrian Daurov. From the moment we started rehearsing together, I knew I was in the presence of a true master - technically brilliant, musically perfect, intellectually stimulating. But these are only the foundation of his extraordinary ability. When you add to this his deep, generous, and fun-loving personality, he is in the great pantheon of musical giants. Adrian is the real thing! Adrian brought a thorough and detailed preparation to his reading of the Shostakovich first cello concerto which was truly inspiring. This music obviously resonates with him on many levels, and he has developed a vision that is sound and authentic. He has the technical prowess to execute the difficult passage work, and the musical intuition that portrays the more introspective aspects of the piece in a delicate and sensitive manner. The audience was totally engaged by Adrian, and reacted most enthusiastically to his dynamic performance. Without hesitation, I recommend Adrian Daurov to colleagues seeking an inspired performer and pleasant collaborator for any level of artistic sophistication. Mr. Daurov, a young cellist who looks the part of the Romantic artist, produced a warm sound and phrased naturally. The Russian-born Adrian Daurov played the solo in Dvorak’s Concerto for Cello and Orchestra. The cello is a bass instrument in the ensemble, yet Dvorak wrote the vast majority of the solo part in a higher range–one with the intensity to sing over the orchestra. Daurov sounded as nimble as a violinist in those sections, and displayed a wide range of expression all over the instrument. I was astonished by his flawless execution of two melodies at once in the slow movement. Adrian Daurov plays with power, charisma and commitment. With a superb technique and a consummate sense of style, Adrian is a tremendous talent and a truly exciting young artist. It [Ranjbaran Fountains of Fin] proved a gripping piece, and the ensembleviolinist Mark Peskanov, the flutist Lance Suzuki and the cellist Adrian Daurovmade a powerful case for it. His [Schnittke’s] grim sonata has become a favorite of cellists, but the dissonanceslarge sections are increasing minor seconds on cello and piano, making a most uncomfortable tapestrywere built up by Adrian Daurov with the most serious intent. This was the first time I had heard the work live, and it came as a revelation. Adrian Daurov is a dazzling cellist with soul and technique to burn. On the strength of its fine concert at the Phillips Collection, the Voxare [String Quartet] could have a good shot at professional viability. Cellist Adrian Daurov turned in richly expressive solos. The group jumps on its music with all fours and makes the tussle worth hearing.